The intent of this page is to provide you with information and resources so that you can make a more informed decision when selecting your next hunting companion. It is in no-way an endorsement of any one breed. By far the most popular breed in the US. The AKC ranks the Lab as the number one breed in registrations for the last 8 consecutive years. More than twice as many dogs as its closest competitor. Labs make excellent all around hunting dogs. At home on the duck pond and goose fields they are also excellent upland flushing dogs. 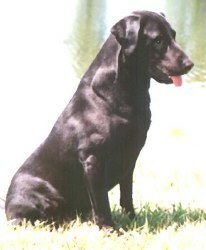 A Labs temperament make him easy to live with and train. Always eager to please the Lab is hard enough to take the pressure of training but soft enough to make him a good companion dog. All Labs have it in them to retrieve. However you will encounter 4 general types. This type is not recommended. Generally speaking the parents will not be screened for genetic disease such as hip-Dysplasia. While they may be registered, registration is no guarantee of quality. The initial cost of your puppy may be low but you could end up paying more in the form of Vet visits and frustration. *Note on Registration: If you are going to compete the dog must be registered. Hunting stock or the "Meat Dog"
For the average hunter this may be an excellent choice. Look for someone that you can go hunting with and watch their dog work. If you can witness a couple of generations or siblings work and are satisfied with their performance then a dog from this type of stock may be just right for you. Conformation dogs are generally not for the serious hunter or someone wishing to compete in Hunt Tests. If you are into dog shows then you need one, they also make great companion dogs. You will often see these dogs with "JH" titles, just keep in mind that a Junior Hunter Title is awarded to a beginning dog and is not really a good indication of desire or serious talent. If you want to Hunt or compete in Hunt Tests then you really need to see the parents work to determine if they truly have the desire needed to accomplish your goals. All the great Hunt Test dogs will have Field Trail ancestors somewhere in their background. Generally Hunt Test stock will be somewhat easier to live with then Field Trail stock. For the average Hunter a dog from a sound Hunt Test breeding is the best choice. They posses strong desire and are easily trained. Filed Trail Dogs are professional athletes. These dogs mature more slowly than Hunt Test dogs. This fact causes them to be more demanding on the owner. Labs generally don't reach mental maturity until two years of age, but an FT dog may take 3 - 4 years to mature. The manic desire to retrieve that is present in puppies is wonderful when the dog is small. For the average person that same puppy like demeanor and desire in a full size 70 -90 LB male is overwhelming. These dogs would rather retrieve than eat. Unless you are very serious about competing you might want to leave the Field Trial Dogs for the pros. According to AKC the Golden is the second most popular breed in the US. Good all around Hunters in the field or water. 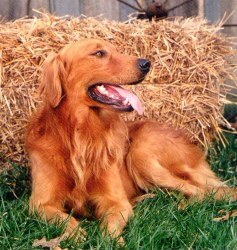 Goldens show a high degree of reasoning intelligence making them excellent upland dogs. A Goldens intelligence causes some debate in the area of temperament and trainability. Some say that they are much softer than a Lab and therefore less likely to respond well to the pressures of training. Others say that their intelligence makes them stubborn. Either way they can make great hunting dogs and companions. Choose your stock carefully. Like the Lab you will encounter several types. Avoid this type because of the lack of health screening for genetic disease. Remember that just because a litter and parents are "Registered" is no real indication of quality. Golden Retriever Meat Dogs are not as common as Labs. You should attempt to see the actual parents hunt and talk to anyone who has a pup from a previous breeding. Generally should be avoided by the serious hunter or those wishing to compete in Retriever Tests. They make excellent companion dogs. Don't be fooled by a "Junior Hunter" Title this is not a real good indication of the dogs abilities for serious hunting. These offer the best choice for the Hunter and individual wishing to compete. This stock will be proven in the Field and in real life Hunting. One other factor to consider in regards to the Golden retriever is Hair length. The length of a Goldens coat can vary greatly between lines. Remember that a longer dense coat will better insulate the dog if you are going to be hunting in cold/icy water. On the other hand if you are hunting in briar infested fields then a shorter coat will be much easier to take care of. More Breeds to be added.